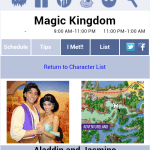 Character Locator is available for iPhone and other mobile devices. 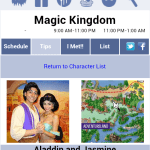 We’re excited to announce that characterlocator.com is now available for subscription. We’ve received hundreds of positive reviews and even made a few changes based on review feedback. 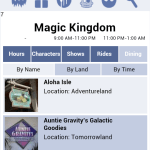 Dining menus with prices for all four parks. 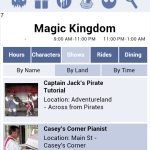 There’s NO app on the market that packs this much information into your mobile device. We’ve invested hundreds of hours into building this app and update it every Saturday night to make sure you have current, fresh information at your fingertips! 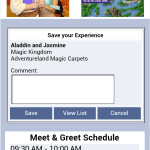 The information found on the bottom bar of the Android app is close to the top on the mobile site app. 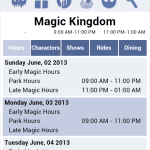 Full four park hours including extra magic hours. But Kenny, why isn’t it in the iTunes or Android market? We desired to build something that can be updated on a moment’s notice. 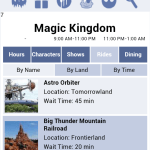 If something changes at the parks, we can respond immediatley to make the change. Static apps like iTunes and Google Play don’t allow us the flexibility to provide you the BEST service possible. 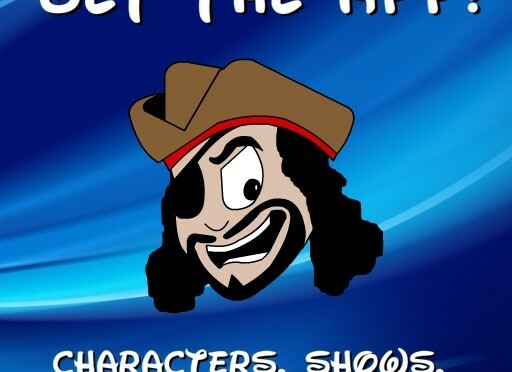 www.characterlocator.com can be purchased using your Paypal account or any major credit card in a secure transaction. You can preview 5 items on each page without purchasing to see how great the app really is. 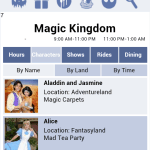 The Disney World Character Locator app is currently available for Android devices. Free download. Upgrade for only $1.49 to remove ads and see all the extra features.